It’s an event so popular some visitors would even plan vacations around it. The Prince Edward District Women’s Institute held their 35th annual art and craft sale on Aug. 2, attracting a total of 3,200 visitors throughout the one-day show. About 220 juried vendors spread throughout four buildings offered plenty to see. Among those who attended the show were Debbie Long and Rebecca VanSteenbergen. A perennial visitor to the show, Long said it offers items that you wouldn’t encounter in most shops. The pair wasted no time, finding items to purchase within a few minutes of arriving. “It’s supporting local,” added VanSteenbergen. Vendor Melis Kalemdaroglu of Consecon said she was enjoying her first time at the show. 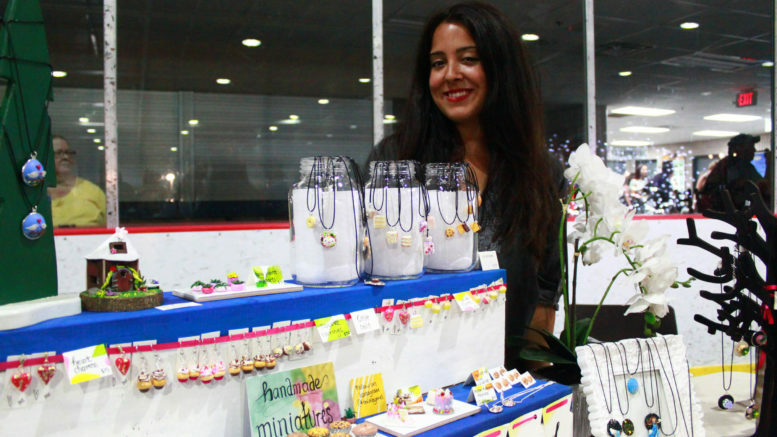 Her business, Mini By Mel (@minibymel on Instagram), sells unique handcrafted jewelry and magnets featuring miniature baked goods and more. “I hand-sculpt everything from scratch using polymer clay,” she said. Kalemdaroglu designs and assembles each piece herself, which usually takes hours from start to finish. “When I make them, the goal is to put a smile on your face — that’s my aim — to make you smile when you see it,” she said. She noted the craft show was great and there was a lot of foot traffic. “It’s fairly crowded I would say, it’s a good day,” she said. She said the event was well-organized and everything ran smoothly. While a final tally of the funds raised wasn’t available, the Women’s Institute routinely uses the money raised at the craft show to support accessible transportation and other local charitable causes. Prince Edward District Women’s Institute president Evelyn Peck said the organization was pleased with how everything turned out. The show has regularly attracted thousands of visitors and has raised thousands for the Women’s Institute, which then directs that money right back into the community. Peck said the continued support feels great. “It makes all of us feel good about where our money is going because the Women’s Institute supports different groups throughout the community,” she said. She said the greater community also benefits from significant economic spinoff. Peck said while the show is a fundraiser, there’s also an added benefit in bringing the various Women’s Institute branches from across the county together. There are bonds that form when working together and planning the show, setting up, and running the event each year. At least 100 volunteers helped put the show on. Peck said it’s a dedicated and generous group. A young group of volunteers came from local 4-H and air cadet groups. She said the event gives those young volunteers some valuable experience while simultaneously allowing those groups to reciprocate the support they receive from the Women’s Institute.